Gardening has so far being considered a leisure activity. Today, having a vegetable garden can actually be a quite rewarding activity for its owners and it is much more than just a hobby since besides giving you the organic vegetables you can also reduce your carbon print! By having your own vegetable garden you can have your own supply of fresh, healthy and chemical free vegetables and at the same time you can save some cash from your supermarket bill. Moreover if you grow your own vegetables you do not have to worry about their quality. Furthermore by producing your own vegetable you help the environment in a number of ways. Your first contribution to a better environment comes from the fact that your vegetable garden is going to be free from chemical that have a negative impact on it since the idea is to produce organic products. Your second contribution comes from the fact that you are reducing the transportation emissions since your vegetables no longer have to travel long distances in trucks to get to you. 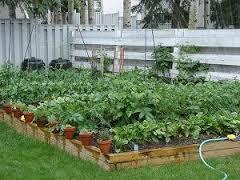 To create your own vegetable garden you do not need much space. You can start from your veranda or a small patch in your backyard. In the beginning you can start small as an exercise of getting acquainted on how to take care your vegetable garden. This way you won’t get frustrated and overwhelmed. As time passes by then you can expand your garden further. Your initial target should be to satisfy your household needs. If there is a surplus then you might want to consider selling it to your neighbors and friends which should not be that hard given the fact that you have not used any chemicals to grow them and therefore are of top quality. Lots of people want to start their own vegetable garden but become discouraged after a while either because they haven’t managed to produce enough or they were not lucky in producing any vegetables because of their lack of experience. So the first thing that you need to do is show dedication, determination and patience. As a starting point of taking care your vegetable garden you must till the soil to get it ready for your small plants so they won’t have to compete for nutrients and sunlight. When you finish tilling the soil, it is the time to apply some organic fertilizer of your choice depending on the type of your crop you like to grow. At this time, organic fertilizer is a must and thus highly recommended. As a matter of fact your can create your own organic fertilizer by composting which is another great way to help the environment. Now the seeds are ready to be planted something that you should do around 5 pm. Planting the seeds in the morning might even work better, but some seeds might actually die from the noon heat. A good idea for protecting your garden is by applying mulch to protect it from arthropods. Also you can shade small plants to keep them moisturized and protect them from the sun. Day by day, you will witness the small miracle our seeds growing into plants and after 2-3 months, you will see the fruit of you labor.